The USB•100 extends any USB device, including a keyboard/mouse connection, up to 330 feet from the computer, eliminating the 17.5 feet distance limitation of USB. 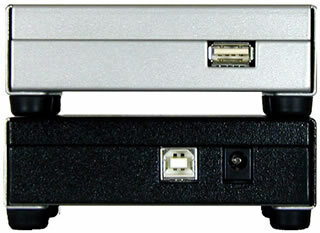 Both the USB•100 sender and receiver units use "Extreme USB" technology by Icron Systems Inc. The USB•100 sender unit is connected to the computer with a supplied USB cable. The receiver unit is connected to the extended peripheral. A CAT-5 cable links the sender to the receiver.